Organic Oblepikha Shower Gel is produced by the Russian beauty brand Planeta Organica. The product is formulated with organic Arctic sea buckthorn oil. It actively rejuvenates and softens your skin, effectively prevents premature skin ageing, gives you a mood boost that lasts throughout the whole day. Ingredients. Aqua, Hippophae Rhamnoides Pulp Oil, Dicocoylethyl Hydroxyethylmonium Methosulfate, Cetearyl Alcohol, Ceteareth-20, Linum Usitassimum Seed Oil, Pulmonaria Officinalis Extract, Guar Hydroxypropyltrimonium Chloride, Cellulose Gum, Parfum, Citric Acid, Benzyl Alcohol, Benzoic Acid, Sorbic Acid. 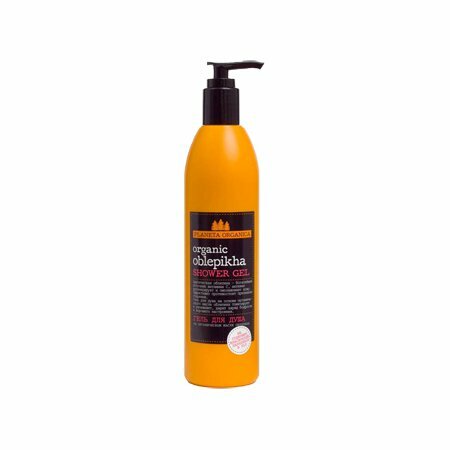 Want to buy Organic Oblepikha Shower Gel? Call us or submit your order via our web site! If you want to enjoy luxurious and exotic beauty products made according to the recipes from different countries, you don’t have to travel overseas. Many cosmetic brands offer beauty products which combine traditional recipes with latest scientific achievements. One of these brands is Planeta Organica. Planeta Organica is a Russian cosmetic brand that specialises in the production of natural and organic beauty products. It is owned by the company PERVOE RESHENIE (“First Solution”). Planeta Organica produces only natural products that do not contain animal-derived ingredients (unless naturally produced by animals). Its products also do not contain SLS, parabens, petrochemicals and GMOs. Beauty products by Planeta Organica are formulated with organic plant extracts and oils certified by the French organisation ECOCERT and its Italian counterpart ICEA. This makes Planeta Organica a trustworthy and reputable brand. Planeta Organica offers a wide selection of beauty products made according to the traditional recipes from about 40 countries which contain 17 unique organic oils. 26 products consist exclusively from plant ingredients and 60% of all the products are based on natural essential oils. That’s what makes Planeta Organica and its products really unique. If you’re looking for organic and natural cosmetics made according to the traditional recipes from Turkey, France, Italy, Ghana, Morocco, Guatemala and other countries, Planeta Organica is exactly what you need.